Most people do not wash their hands properly. Many sources say that you should scrub your hands for at least 15-20 seconds. A good way to keep track is to sing a song like Twinkle, Twinkle, Little Star. Here is a Lysol LYSOL® Healthy Touch® No-Touch Hand Soap System that has been modified using Arduino to show a countdown and play Twinkle, Twinkle, Little Star..
Cut off all the wires from the board. Solder some solid core wires to the IR receiver. Now, lets take a look at the schematics. 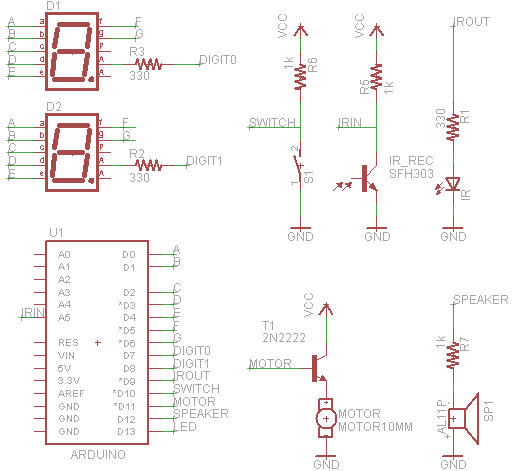 Here is the schematic to hook up the parts. You can see the resistors for both of the displays. For the other resistors and the transistor, we use another piece of perfboard. Now finish the wiring and hook it up to the Arduino. Now time to program the Arduino. Now it's time to program the Arduino. Download the source code from below. Change the pins in the program to match what you hook them up in the Arduino.